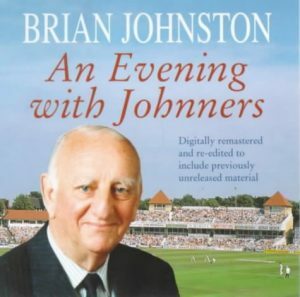 In 1993 at the age of eighty, Brian Johnston embarked on his first ever nationwide concert tour. His one-man show An Evening With Johnners was a sell-out across the country and the recording of his show became the best-selling Spoken Word production in the UK for more than six months. It even entered the pop album charts and was awarded a Gold Disc Award for sales of more than 100,000. Brian was a master raconteur and he had the audiences in gales of laughter as he recalled many of the gaffes and humorous anecdotes from his life at Eton and Oxford, his service with the Guards and his 48 years in broadcasting. Now An Evening with Johnners has been digitally remastered and re-edited to include previously unreleased material from Brian’s second tour at the end of 1993. This is a superb opportunity to hear one of cricket’s greatest storytellers.